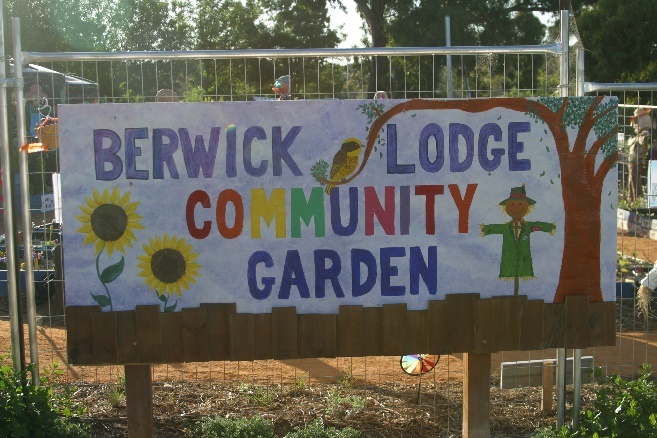 Over the past few years we have designed, created and built three new gardens at Berwick Lodge Primary School. Our first garden was our Community Garden, located at the end of gymnasium and next to our After School Building. The garden was officially opened by Cr Mick Moyland in November 2014. 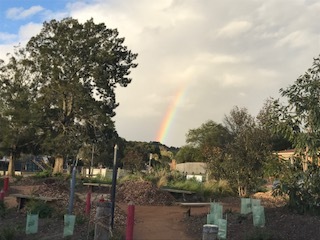 Our garden was built by volunteer community members, families, staff and students with mostly recyclable and reclaimed materials. The garden is an ever evolving space that changes season by season. 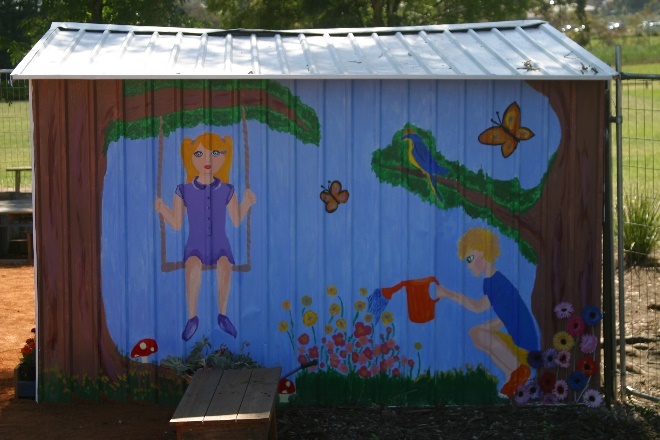 The garden provides hands on learning experiences where the students develop an understanding of gardening and growing their own food. After successfully applying for an ANZAC Grant, we commenced construction during 2016 of our Memorial Garden. 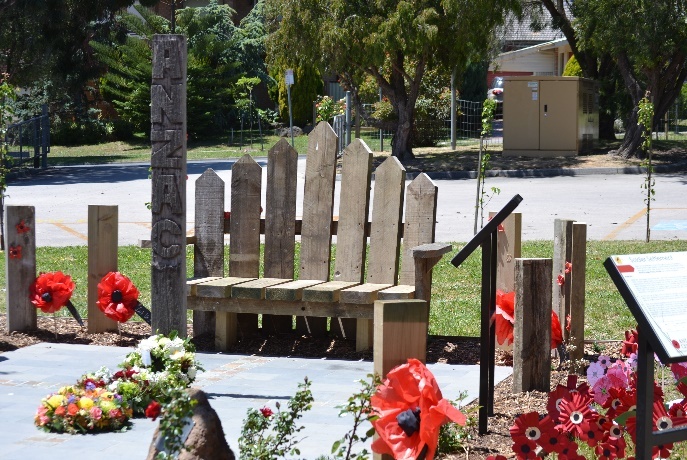 Located just near the staff car park, the garden encompasses our flag pole, memorial seat, Gallipoli roses, remembrance rosemary and our signs commemorating the conflicts Australian soldiers have fought in. 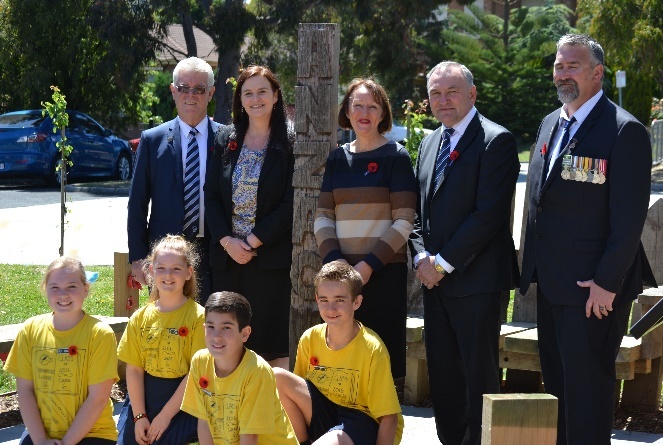 The garden was opened in conjunction with Remembrance Day 2016 by Judith Graley MP, representing the Victorian Minister for Veteran Affairs. Nearly complete our sensory garden is our newest garden that we have developed within our school gardens. 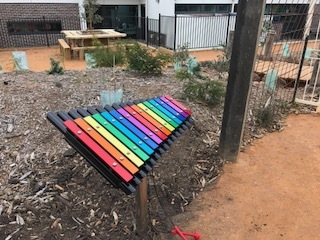 Our sensory garden has items and plants that can stimulate or calm the senses including touching plants, smelling leaves, listening to water, music and movement of plants, seeing colours, tasting foods and exploring other tactile areas of the garden. Construction commenced late in 2016 and the garden is now open to our school community to use during both class and recess times. The official opening is scheduled for December 2017. We have a very active student garden club and as the garden continues to grow these students are involved with planting, propagating, weeding, composting and harvesting. Students also attend special Garden Club excursions and cook with the produce from the garden. The JSC (Junior School Council) is the student Leadership Group at our school. Two students are selected from each class from their peers and teachers. These students have shown that they are responsible, dependable and hardworking. 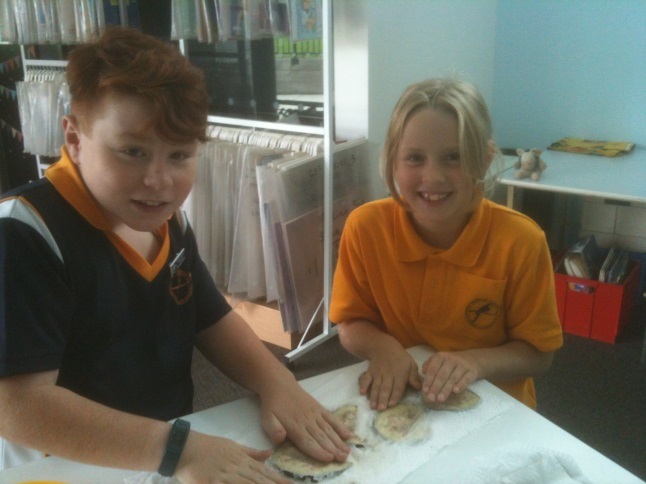 They are able to speak publicity and represent their peers in important whole school matters. We meet every week on a Friday. We look at community concerns and issues and work hard to raise money, food or other items to address some of these needs. We also look at how we can improve our school and make it a better place for everyone. JSC is made up of a student body, chosen by peers to represent their grades. We develop ideas for fundraising and run events that will benefit our school and community. We strive to make the school and community a better place. We look forward to working with the whole school community and making a difference to 2016! We will share our projects and stories on this page.  Please check us out regularly to receive the latest updates and news! Why should Robotics be taught in schools? There is considerable anecdotal evidence that students respond well in subjects involving programming of robots. At Berwick Lodge Primary School we offer a whole school robotics program that begins in Prep and ends in Grade 6. There are several competitions for a range of age groups that can channel competitive instincts in a positive way. For example, asking children to build a robot from a Lego set and then running a race to see which robot goes fastest works well. Berwick Lodge Primary School has even competed on the international stage in the First Lego League competition and won! There’s no doubt that there will be a need for people to be involved in programming mechanical devices in the foreseeable future. The drone industry has taken off. There is considerable evidence that robots are particularly suitable for engaging with children on the autism spectrum. Children on the spectrum respond to the calm, clear, consistent interactions that robots can provide. Repetition, predictability and clear emotions work well. On a bi-yearly basis, teacher and student representatives from Berwick Lodge Primary School travel to Singapore to visit the school’s sister school Tampines Primary School https://tampinespri.moe.edu.sg/ and to explore all the places, sights and sounds of the beautiful country. In 2010, Berwick Lodge teachers visited Singapore to explore the sights and educational possibilities for future visits. In 2011, the school made it’s first trip to Singapore with 12 students. The school returned to Singapore in 2013, 2015 and recently in 2017. Read what the students had to say about their experiences in Singapore from 2011 to 2017 by clicking on the link below. Our new STEM Learning program is an extension robotics and coding program at Berwick Lodge Primary School. Watch these fantastic videos to learn about what our students are learning about in STEM Learning at Berwick Lodge Primary School. 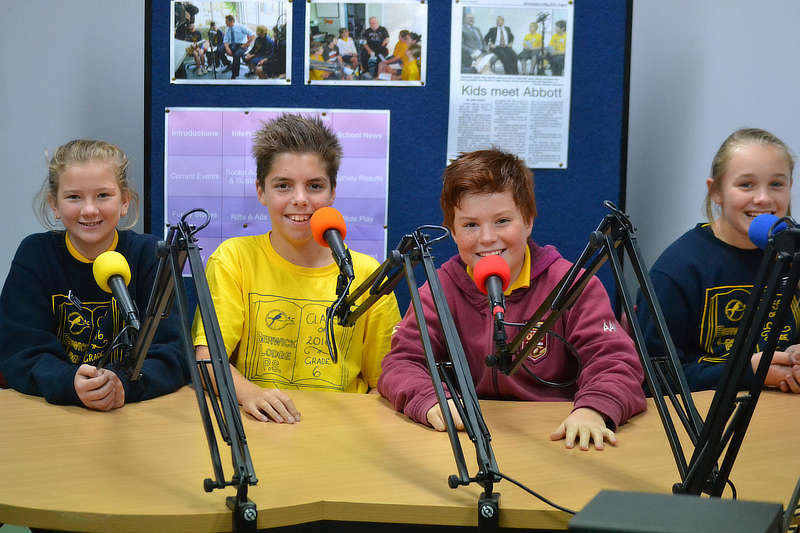 Every Wednesday afternoon between 2.oopm and 3.oopm, Berwick Lodge Primary School broadcasts a Grade 5/6 radio show on 97.7FM Casey Radio. The Student Hour can be streamed from Casey Radio’s website at: https://www.3ser.org.au. Children have the opportunity to interview students from other schools, special visitors to our school and leaders in the local and national community. Not only do they research their topics and guests, but they also prepare their questions, operate the panel and assist with the production of each show. 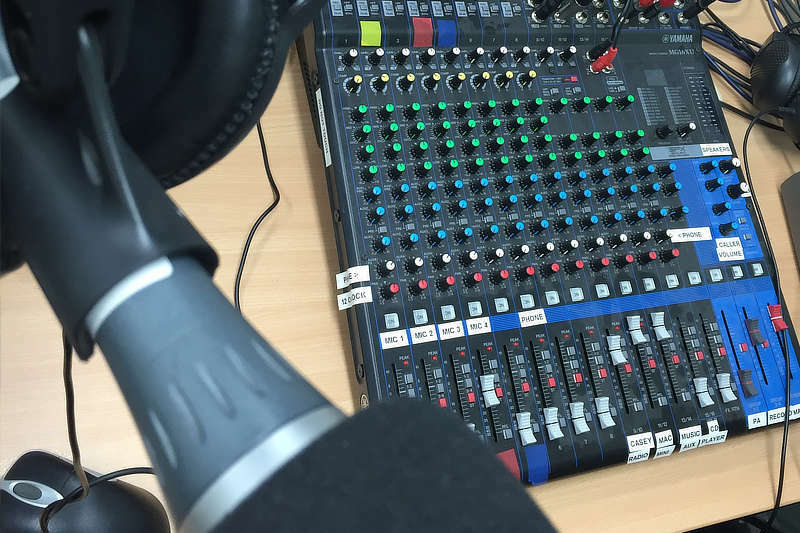 At the press of a button, our students broadcast their program to the world via Casey Radio’s streaming capacity, Casey Radio being one of Melbourne’s leading community radio programs. It’s a lot of fun, engages the children in cutting edge multimedia educational practice and it’s hard to believe that we’ve been doing this now for 15 years! At Berwick Lodge, we use Scratch and Scratch Jr (iPad), LEGO WeDo/Mindstorm kits and Arduino for our robotics and coding program. We also have a 3D printer. In Multimedia, we currently use iMovie and our green screen studio to create films! We also have our very own radio show on 97.7FM Casey Radio at https://www.3ser.org.au/. The show is produced in our very own radio studio and is broadcast on a Wednesday afternoon from 2.oopm – 3.oopm. At Berwick Lodge Primary School, Rob Kelly is the multimedia teacher and robotics coordinator (2015 – present). Michele Tan is Berwick Lodge Primary School’s ICT Leading Teacher (2016 – present).